Are you addicted to the Facebook news feed? 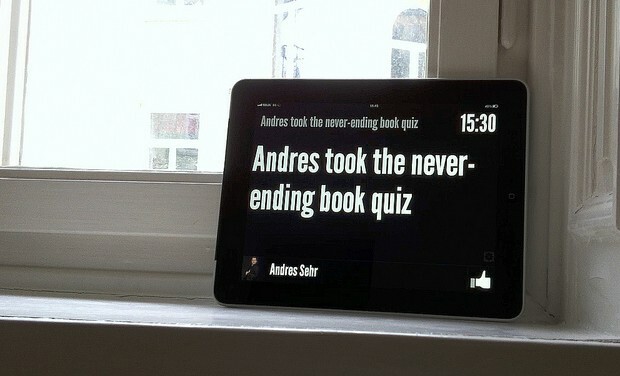 You can turn your iPad into an automatically updating Facebook news stream thanks to a free little web app called FNews. Featuring a simple and minimalist interface with attractive typography and large text, the webapp is perfect to sit on an otherwise idle iPad (or iPhone too) and give you constant updates from the world of Facebook. Visit FNews from your iPad and login, then bookmark the page for easy access. The app is optimized for the iPad, but it’ll load fine from any other browser. If you’re brave enough to hang your iPad 2 from a refrigerator, then you’ll have the most exciting fridge magnet on the block. FNews is open source and you can poke around the code if you’re into that sort of thing. Check out the developers page for more information on the webapp and how it works. Really? The only use he could find for the iPad was to turn it into a Facebook news feed? Good grief. I like the app, but what a waste of an iPad!